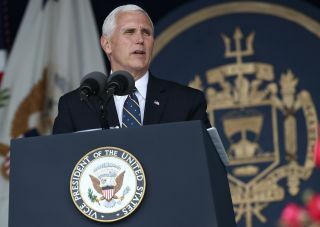 Vice President Mike Pence is scheduled to visit NASA's Johnson Space Center on June 7, to greet the agency's new class of astronauts. Vice President Mike Pence is scheduled to greet NASA's newest class of astronauts Wednesday (June 7). NASA's Johnson Space Center (JSC) in Houston is scheduled to host an event on Wednesday to announce the names of its newest class of space travelers. More than 18,000 people applied to the astronaut program during this round, a record for the agency. The event will be broadcast live on NASA TV at 2 p.m. EDT (1800 GMT). During his visit to JSC, Vice President Pence will tour the mission control center and "hear briefings on current human spaceflight operations," according to a statement from the agency release Friday (June 2). The announcement did not say whether the vice president would deliver remarks during the event. Vice President Pence is set to chair the National Space Council, which will be reinstated per the instruction of the NASA Transition Authorization Act that President Trump signed into law on March 21. NASA is expected to select between eight and 14 new astronauts from among the applicants. The agency is scheduled to continue sending humans to the International Space Station through 2024, and the agency is working on plans to send humans to the space between the Earth and the moon, as well as into lunar orbit, in the 2020s. The agency is working on long-term plans to send humans to Mars as early as the 2030s.